A Turkish Air Force AS-532AL Cougar helicopter takes off from Incirlik airbase in the southern city of Adana, Turkey, July 27, 2015. Kurdish fighters in northern Syria accused the Turkish army of shelling their positions on Monday. Turkish warplanes bombarded Kurdish militants in northern Iraq Wednesday, hours after President Recep Tayyip Erdogan said it was impossible to continue peace efforts with the Kurds. Ankara's fighter jets hit shelters, depots and caves in six areas, Prime Minister Ahmet Davutoglu's office said. It was the biggest assault since Turkey launched strikes last week against the Kurdish militants and Islamic State fighters in northern Syria. Iraq condemned the air attacks as a "dangerous escalation and an assault on Iraqi sovereignty." Davutoglu has called the fight against the Kurds and Islamic State a "synchronized fight against terror." But Turkey's assaults so far have been heaviest against Kurdistan Workers Party (PKK) targets, in Iraq and in southeastern Turkey. Ankara's pro-Kurdish opposition has accused Erdogan of launching the strikes as revenge for the party's strong showing in June's elections that kept the ruling party from keeping a majority in parliament. "Our only crime is to win 13 percent of the vote," said Selahattin Demirtas, the leader of the pro-Kurdish Peoples' Democratic Party. 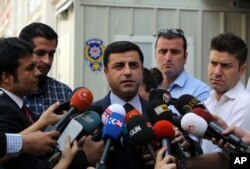 Pro-Kurdish Peoples' Democracy Party leader Selahattin Demirtas speaks to the media about Turkey's airstrikes against Kurdish rebel bases in Iraq, in Ankara, Turkey, July 27, 2015. Erdogan initiated peace negotiations with Kurdish interests in 2012, to try to end the PKK insurgency that dates to 1984. But he said Tuesday the process had become impossible to carry out and called on parliament to strip lawmakers with links to the militants of their immunity from prosecution. Parliament is set later Wednesday to debate Erdogan's immunity proposal and the military operations. The prime minister's statement also said authorities had detained more than 1,300 people in Turkey in raids against suspected members of the PKK, the Islamic State and other militant groups. NATO held an emergency session Tuesday at Turkey's request, issuing a statement condemning terrorist attacks against it and pledging solidarity with the country. After months of reluctance, Turkey last week launched attacks on militant targets across its border into Syria after a suicide attack in Turkey killed 32 people and a car bomb killed two Turkish soldiers. Ankara also agreed for the first time to let the U.S. and NATO use the Incirlik air base for airstrikes on the extremists, sharply cutting the distance for American fighter jets that had been traveling from Iraqi air fields for attacks on Islamic State targets in northern Syria. But Turkey's aerial attack to push Islamic State fighters out of its long boundary with Syria is likely to complicate fighting. Syrian Kurds are among the most effective forces battling extremists in Syria and Iraq, but Ankara fears they could boost the Kurdish insurgency inside Turkey.